Extension Center allows users to create and modify objects, screens and rules within SuccessFactors. It enables system administrators and consultants to create custom objects and screens without the requirement to code. Business analysts, consultants and HR administrators are able to all of the logic, fields and behavior without writing a single line of code to deliver features and functions much faster; and add new fields, objects and screens to meet their business requirements. Extension Center is essentially in App extension framework meant for Customer and Partners to build Extensions on top of Employee Central to meet their specific Business Needs. Want to give perspective of extension center from SAP Cloud Platform extension point of view. This blog is no means a full pledged overview of everything that be done from the extension center on SuccessFactors side. What is Extension Center ? 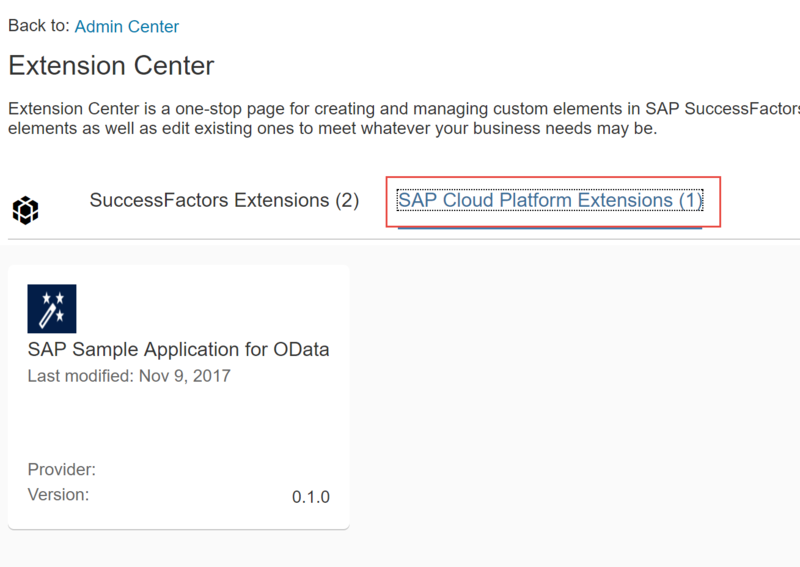 Extension Center allows you to create and manage SF Native extensions and configure SAP Cloud Platform extensions. An SF Native extension is a custom application, which is configured to process employee-centric business needs. For example, as an Admin you can create applications to manage different HR Programs, such as company car requests, employee wellness programs, tuition reimbursement request, pension plan programs, and so on. An SAP Cloud Platform extension is an application, designed to serve a certain scenario or task flow. This application is deployed in the SAP Cloud Platform for your extension subaccount. When to use Extension Center ? Guided, business-friendly approach to create and manage new extensions. Often times, a single screen, UI or workflow can solve these functionality gaps without the need to purchase additional software. Extensions can fill in critical business processes and make the business processes unique. Thus, we provide the ability to extend beyond your core business processes through our extensibility capabilities. Custom objects created in extension can serve dual purpose, It can not only fill gap in SuccessFactors but also can be exposed as OData API’s which can be consumed by SAP Cloud Platform to create new apps or interface with external data with HR and many more types of extension application by leveraging enterprise grade service offered by SAP Cloud Platform. How to create an Extension ? What permissions do you need to use Extension Center? How does Extension Center work? Extension center not only serves as place to manage native SuccessFactors objects but also extension applications deployed to SAP Cloud Platform account provided if your SAP SuccessFactors company integrated with an SAP Cloud Platform extension subaccount. Then from within the Extension Center, you can also configure SAP Cloud Platform extensions that are applications deployed in this cloud platform. The SAP Cloud Platform extensions are applications, designed to serve a certain scenario or task flow. These applications are deployed in the SAP Cloud Platform for your extension subaccount. Then, they appear in the Extension Center in the SAP Cloud Platform Extensions tab. HR Administrators can also view the list of installed SAP Cloud Platform extensions and configure SAP Cloud Platform Extensions from extension center. To configure each one of these options you are redirected from the Extension Center to the respective tool in SAP SuccessFactors. From Access points, You can open extension application URL and configure the Home Page tile for the extension application. From Connections tab, You can check OAuth Client and change the system user only connections with name sap_hcmcloud_core_odata_technical_user. From the Permission Roles tab. You can configure the permissions for the listed role of the extension application. When to use in-App extensibility versus side-by-side extensions ? Since there are two options to go about with SuccessFactors extensibility i.e. in-App extensibility via extension center and side-by-side extension on SAP Cloud Platform. Questions always comes when to use what ? Let’s looks at pros and cons of using one option over the other. Extension center fills gap to create new extensions without the need to code, mostly designed for business users and Serves as a “one-stop shop” for all extensions built in SAP SuccessFactors solutions, Which might suffice your business requirement. With creation of custom object, data still resides in SuccessFactors. All the standard extensions like Field , Object , UI and Logic extensibility will mostly fall under in-App extension category “extension center”. But when it comes to complex integration scenarios like mesh data with 3rd party solution or on premise SAP solution, new application, newer UI with choice of your runtime and want to keep your core intact from all the enhancements then SAP Cloud Platform is way to go. As we move to the right as depicted in the above diagram, SAP Cloud Platform will suit for building complex and custom extensions. Extensibility is core to SAP strategy, with choice options of in-App and side-by-side extensibility, you can use extensibility options to meet your business requirement or innovate quickly to address different ends of the extension spectrum. With in-App extension “Extension center”, Business users can quickly build, manage, and edit extensions using the Extension Center – without the need to code. For more complex scenarios,SAP Cloud Platform is a flexible solution for customers who want to extend their SAP SuccessFactors solutions or HCM on-premise capabilities and also you can leverage partner-built applications on SAP Cloud Platform to meet unique business needs.